Used in India as a powerful aphrodisiac. Believed to attract love, wealth, and protection. Used in magic since the middle ages. An herb with much history and value. The MOST powerful root one can possess in my opinion. This root is an authentic, home-grown mandragora (NOT american mandrake or may apple), grown by myself from SEED! Care, respect, and love nurtured this little being to bring you the most potent magic. You will find NO better quality herb or oil!Anointing a paper with a name written on it is believed to draw love from that person. Anointing a paper money with this oil is believed to bring wealth. Lore~ In the Middle Ages, a Mandrake would fetch a high price. Small slices of the root would be sold to sailors to protect them on their voyages. Pieces would be sold to place over the entrance of a house to protect the home from fire and intruders. Pieces would be placed under pillows to The Mysterious Human-Shaped Mandrake Root promote dreams and under mattresses (particularly those of infants) to protect from nightmares. A complete Mandrake root would command a high price, and the more it looked like a human being, the higher was that price. But since the plant grew wild, those who made money from selling Mandrakes circulated stories about the problems of trying to obtain one straight from the soil, to discourage others from simply helping themselves. Since the Mandrake root looked human, it was said that it was alive and to take it from the earth was to tear it from its home. It would, therefore, give a terrible scream when pulled up. That scream was so terrible that it would drive insane the person who had tried to take it, or even kill with its shriek. There was, then, a special way in which one obtained a Mandrake. Needed were a hunting horn, a length of rope, a hungry dog, and a piece of meat. The Mandrake was said to grow beneath a gibber, feeding on the fat dripping from the hanged corpse. On the night of a full moon, the magician had to drop a noose of the rope over the Mandrake and then tie the other end to the dog's collar. He would then retire to a safe distance and throw down the piece of meat. The dog, being hungry, would lunge forward to get the meat, pulling on the rope and dragging the mandrake out of the soil. At that point the magician should blow loudly on the horn to drown out the sound of the plant's scream. The dog would hear the scream and, allegedly, die instead. feedback- "My husband of 23 years had been not communicating with me, was not showing any affection, and this was going on for about 5 years. For $5.55 , the cost of this oil, he sat down and wanted to talk. He wanted to try to make things better. What? Who are you??? I have been wanting to reconnect for years and have been so sad that he was shutting me out. I have tried to get him to watch marriage dvds, i read books to try to help things, but within a week of getting this and rubbing some on the headboard of our bed, he texted me a romantic message, he wanted to 'talk' and we went out for a fantastic dinner. He told me I looked really nice and i could tell he was "taken"with me. Like the old days!!! oh, and on the way out the door for dinner, I gave him a hug and rubbed a little oil on his shirt. I had put some on my shoes...i don't know what i am supposed to be doing with this oil. so i am just putting it where I can. The bed seemed like the perfect place since we spend the most time together there. This stuff works. And it is really crazy! I already placed another order for some other items to calm down our teenage boys, to bring peace into our home. I can't wait to try the new stuff! Thank you so much for your help! Sarah, you are amazing!" "Hi there! I wanted to share this story with you. It has to do with the Mandrake Mandragora Oil I purchased from you several months back and just happened literally, two hours ago! Earlier this year, I applied for the Social Work program at my local college and was upset to find out I had not been accepted, but rather put on the waiting list. Time had passed and I was notified that the program was full and I would not be attending the school this fall. This news was a great disappointment to me, but did not deter me from being persistent and re-applying in hopes of attending next year. Thoughts of the program kept entering my mind- sort of worries- what if I don't get accepted again? What will I do? I really want this! I decided to work on manifesting my entrance into the program. I had a booklet with the name of the program saved from the program information session last October. I decided to cut out the name of the program and pin it up on the bulletin board that hangs on top of my computer so I could look at it every day. This was two days ago. 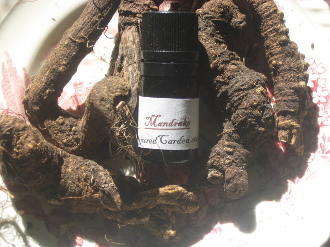 This morning, I saw the Mandragora Oil I had ordered from you sitting on my shelf. I intuitively picked it up, doused the cork in the oil and wrote "ACCEPTED" overtop of the paper with the name of the college program on it. About 30 minutes to an hour later, I recieved a phone call from the college letting me know that a space has opened up in the program and that they don't usually do this, but they are offering me "conditional acceptance"! I am so pleased at this news!!! And so amazed at the synchronicity I just experienced. I guess the Mandrake Oil is as powerful as the lore states! Have a great day! x"
Thanks for looking! Ashe! curio only! Conjured Cardea is not responsible for the misuse of this oil or any other product! © Conjured Cardea™ 2009. No part of the content, designs, photographs, product trade name(s), trade product design(s), intellectual property, and product(s) can be used without prior express written permission. All rights reserved.